Along with corrosion protection, welding errors are one of the most frequently uncovered issues during a post-repair inspection, 3M advanced technical specialist and 23-year I-CAR instructor and weld tester Shawn Collins warned shops this summer in a quality control class. Collins, who also surprise-audited shops for VeriFacts for four years, regaled the class with some anecdotes about flawed welds and examples of errors uncovered by reinspection firm Collision Safety Consultants. A panel meant to receive 30 welds might have half of them not completely filled, Collins said. The technician would have to be coached, “‘That’s like not putting all the bolts back on the vehicle,'” he said. “Welding … probably needs a little help in our industry,” Collins said. Learn about joining during SEMA with Toby Chess of Kent Automotive at “Adhesive Joining in Modern Repairs” and Dave Gruskos of Reliable Automotive Equipment with “Get Attached to Following Procedures: A Comprehensive Guide to OEM Joining”. The sessions are part of the Society of Collision Repair Specialists Repairer Driven Education Series Oct. 30-Nov. 3. Register here for individual classes or the series pass package deal. Talking to a shop ahead of Collins’ I-CAR weld testing, an owner might declare his team to be great welders, Collins recalled. “Five hours later,” a technician is “struggling badly” — and the shop had no idea of the skills gap, he said. However, a shop’s welding difficulties might be actually solved fairly painlessly. “A lot of that’s related to eyesight,” Collins said of such welding struggles, echoing an analysis we’ve heard from both one of Collins’ I-CAR colleagues and SCRS educator Toby Chess. Collins said he carries “cheaters” glasses and gives them out at weld tests. Once the welder dons them, their “world just changes,” Collins said. Collins also suggested shops minimize welding issues by using spot welding instead of MIG welding, calling the former “much better” for the vehicle. “I know they’re not cheap, but I think it’s a necessary piece of equipment,” Collins. Sometimes, shops get tripped up by trying to mimic the joining done at the factory — not realizing that the OEM wants the aftermarket to use a different attachment technique, according to Collins. Something spot-welded at the factory might need to be bonded by the aftermarket, he said. 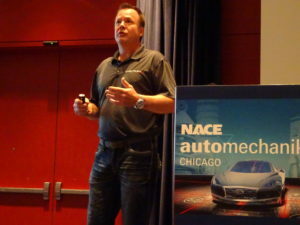 “We’re seeing that more and more often,” Collins said of different joining techniques, and shops shouldn’t assume they can “reverse-engineer” the factory.